Name someone who's the subject of many jokes; two words. Remove the space between the words. Insert the letters O and N in that order — not necessarily consecutively — inside this string of letters. The result, reading from left to right, will be two words of opposite meaning that this someone might say. Who is it, and what are the words? Ross got this pretty quickly, while I was still stuck thinking about various clerical types walking into a bar... The answer (we believe) is ST. PETER + O + N = STOP + ENTER. 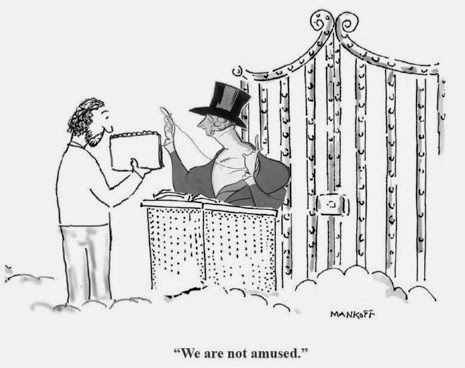 A cab driver reaches the pearly gates. St. Peter looks him up in his Big Book and tells him to pick up a gold staff and a silk robe and proceed into Heaven. Next in line is a preacher. St. Peter looks him up in his Big Book, furrows his brow and says, "Okay, we'll let you in, but take that cloth robe and wooden staff." The preacher is shocked and replies, "But I am a man of the cloth. You gave that cab driver a gold staff and a silk robe. Surely I rate higher than a cabbie!" Will Shortz comes up with such lame puzzles that I really don't think he knows it. If he had the back-up consultant that I have suggested, he would have been informed that "St." is not a word. This is the worst challenge of the year and is in the running for last year, too. And blurry pictures were a pleasure compared to the current anti-robot, with whom, unfortunately, I am about to tilt. Yes, that one caught my eye too(th). Very artistically savory, like Escher with a camera. That the girl is holding the frame a tad atilt only adds to the effect. This is why photoshopping was invented!